EAST AURORA, N.Y.--(BUSINESS WIRE)-- Astronics Corporation (Nasdaq:ATRO), a leading provider of advanced technologies for the global aerospace, defense and semiconductor industries, announced today that its wholly owned subsidiary, Astronics Advanced Electronic Systems (AES), is providing its new wireless charging module (WCM) for integration into several suppliers’ seat models. The first integrations are scheduled to roll out on aircraft in early 2019. Astronics AES’ new wireless charging module, introduced last April at the Aircraft Interiors Expo, has rapidly gained widespread recognition as a new, highly desirable option for charging passengers’ electronic devices (PEDs). 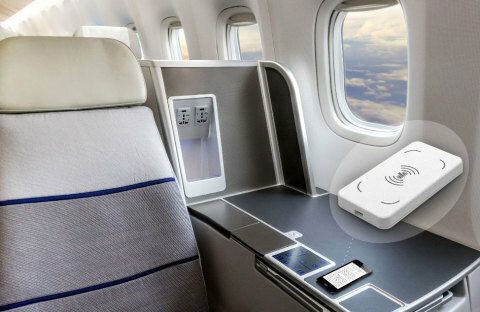 Airlines are anticipating the passenger demand for wireless charging and in response, seat manufacturers are integrating this unit into their seats and furniture to provide quick charging of Qi-enabled wireless devices such as mobile phones and tablets. EmPower in-seat power is already the industry’s most adopted PED charging option with more than 240 airlines providing EmPower systems. The new wireless charging module represents an easy way to provide the convenience of wireless charging while creating a superior passenger experience, maintenance, and support model for WCM installations. The 15 watt charger is Qi (“chee”) certified and is compatible with the most popular mobile devices offered from Apple®, Samsung and others that are Qi-enabled. Astronics AES is also working with additional seat suppliers to outfit wireless charging programs that will occur later in 2019 and beyond. For more than 20 years, Astronics AES has developed and delivered intelligent power management systems to the world’s aerospace industry. With more than one million outlet units delivered, the patented EmPower® in-seat power system is currently in service with over 240 airlines. Astronics Corporation (NASDAQ: ATRO) serves the world’s aerospace, defense and semiconductor industries with proven, innovative technology solutions. Astronics works side-by-side with customers, integrating its array of power, connectivity, lighting, structures, interiors and test technologies to solve complex challenges. For 50 years, Astronics has delivered creative, customer-focused solutions with exceptional responsiveness. Today, global airframe manufacturers, airlines, military branches, completion centers and Fortune 500 companies rely on the collaborative spirit and innovation of Astronics. For more information on Astronics and its solutions, visit Astronics.com. The ‘Qi’ symbol is a trademark of the Wireless Power Consortium.